All quarterly meetings are held the 1st Sunday of the 2nd month of each quarter. The Annual meeting is held at the last federation dance except when that dance is in December. Location: Comfort Suites, Highway 441, Commerce, Ga. Turn left after getting off I85 approximately ¼ mile on left. We meet in conference room, ask desk for directions. The Northeast Georgia Federation of Square Dancers (NEGF) was organized in about 1968 by three clubs - HAPPY SQUARES, Athens; JEFFERSON SQUARE DANCE CLUB; and LAKESHORE SQUARES, Gainesville. Since that time, NEGF has grown with the spread of square dancing in the area and there are numerous clubs in our region. When you join a club that is a member of the NEGF, you are automatically a member of the Federation. There are no NEGF dues to either member clubs or individual dancers. Members of NEGF clubs can dance at other NEGF clubs at their regular club dances at no charge, thereby encouraging visitation between clubs. 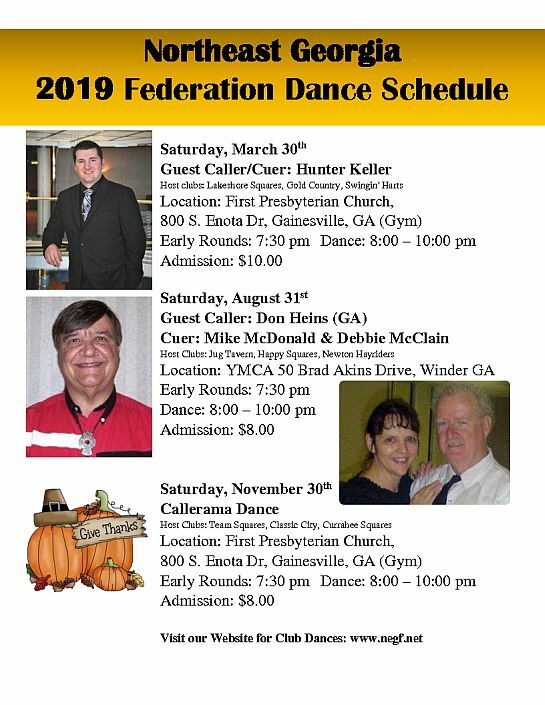 All financial support to operate the Federation is derived from door charges at Federation dances, which are held in various loations four times a year on fifth Saturdays. Callers from inside and outside the Federation give dancers an opportunity to dance to a variety of outstanding callers. Everyone brings finger food and our two host clubs furnish drinks, serve and clean up. The Federation also serves as a forum for the exchange of information and ideas about growing and strengthening our dance community for the greater enjoyment of all. The Federation is governed by an Executive Committee consisting of representatives from each of the clubs, the Federation officers and the immediate past President. Each club has one vote. Georgia State Square Dance Association (G.S.S.D.A.) representatives to the Northeast Georgia Federation are non-voting members of the Executive Committee.